A work experience placement has led to a new volunteering venture for Year 11 student, Luke Crowther. UTC Swindon became a registered CAS (Computing At School) Lead School last year, as a result of meeting several criteria, including offering support to other schools in our local community through sharing good practice. .
Students at UTC Swindon have been putting their civil engineering skills to the test with a bridge-building project set by a national construction firm. 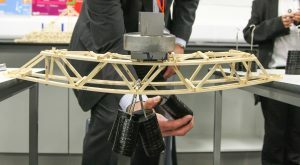 The Year 10 students worked in teams, supported by staff from HOCHTIEF (UK) Construction, to build a bridge which could support as much weight as possible. The aim of the project was to introduce students to careers in civil engineering and develop skills of teamwork and innovation. Before Easter, the Gloucestershire & Wiltshire training provider network (GWP) and Swindon Borough Council came to UTC Swindon to deliver a CV writing session. 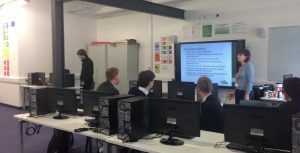 Year 12 and Year 13 UTC Swindon students attended the session to get advice on apprenticeships, jobs and writing effective CVs. GWP and Swindon Borough Council began the workshop with an overview of apprenticeships, before going into further detail about how to write a good CV and apply for apprenticeships and jobs. UTC Swindon was recently visited by Kwik Fit who ran a practical session with Year 11 students. 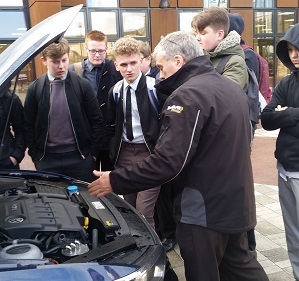 During their allocated enrichment time, the Year 11 students went under the bonnet to explore various car maintenance tasks and safety requirements. 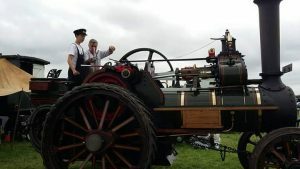 The Kwik Fit team taught students about a variety of important checks and things to be aware of, such as tyre safety and how to determine the tyre pressures of the car. Students also learnt about legal tread limits and car maintenance, including checking fluid levels such as oil, screen wash and coolant. We are very grateful to Kwik Fit for their visit and hope to welcome them back for more valuable sessions like this in future. Limited spaces are available for Year 10 and Year 12 for September 2017. For details on how to apply, please visit the Apply section on our website. To apply for Year 10, please apply via Swindon Borough Council, and then confirm your application with us by completing this short form. To apply for Year 12, please apply to us directly by completing this short form.